Roddy, a Rottweiler owned by Becky Buffum, in an Austin bookstore. 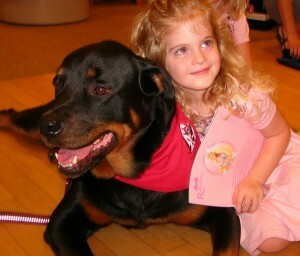 Roddy is a READ dog (Reading Education Assistance Dog) who helps children by listening to them read to him. 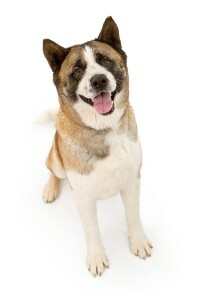 He is a very good listener and builds the child’s confidence. Roddy frequents schools, bookstores and libraries in the READ program. 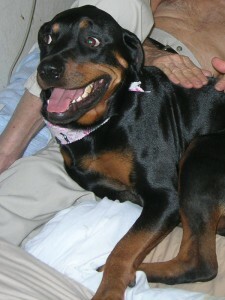 Sandy (American Pit Bull Terrier owned by Karen Cole) and Roddy (Rottweiler) are certified therapy dogs. 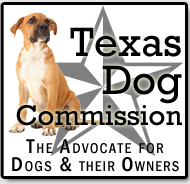 Here they are at a Texas elementary school promoting responsible dog ownership. 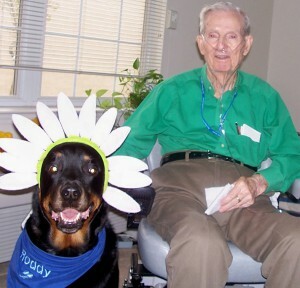 left: Cassidy (Rottweiler), a Certified Therapy Dog owned by Becky Buffam, visits an elderly man who insisted that she sit on his bed. below: Roddy (Rottweiler), a Certified Therapy Dog, visiting his friend, Vern. In his last days, Vern was in bed with his eyes closed. Roddy put his paws on the bed and Becky put Vern’s hand on Roddy’s chest. Vern smiled and started patting Roddy, his pal. Within a few hours Vern was gone. Roddy was proud to have given Vern his final smile. below: Zena (American Pit Bull Terrier), Zandra’s dog, participating in an AKC Tracking Event. Zena is tracking a person’s scent (search dog work).